Senior cap and gown photos are now available for purchase! Click on the following link and pay directly through the website. Hello Designers! Attached is the Week 30 update. 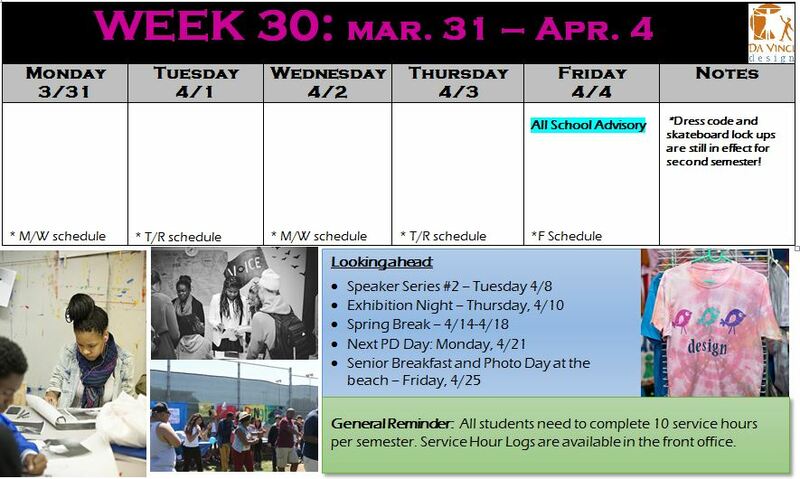 While there are not many events this week, next week brings Part 2 of our DV Parent Workshop Speaker Series on Tuesday 4/8 and Exhibition on Thursday 4/10! The second parent workshop will be held on Tuesday, April 8th from 6-7pm in Ms. Vance’s room (103). 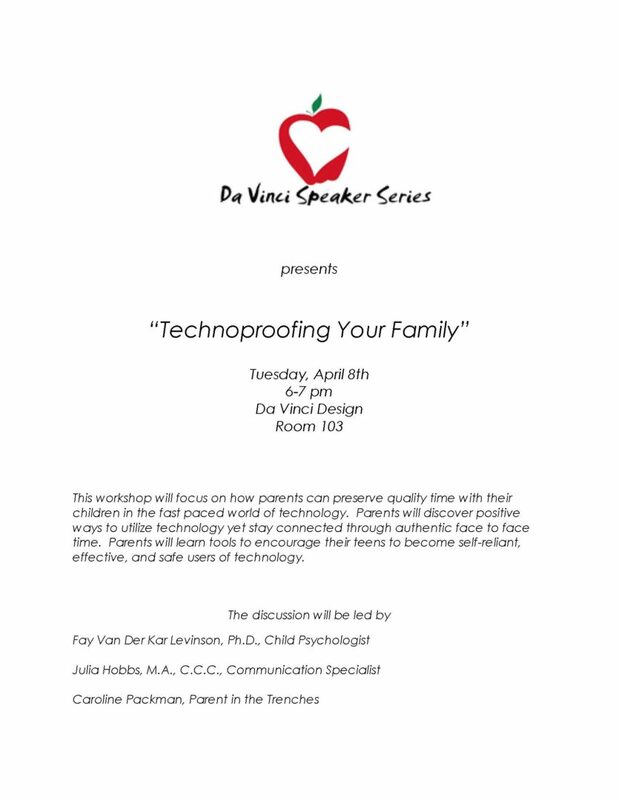 This workshop will focus on how parents can preserve quality time with their children in the fast paced world of technology. Parents will discover positive ways to utilize technology yet stay connected through authentic face to face time. The event will provide parents with tools to encourage their teens to become self-reliant, effective, and safe users of technology. The discussion will be facilitated by Fay Van Der Kar Levinson, Ph.D., Child Psychologist, Julia Hobbs, M.A., C.C.C., Communication Specialist, and Caroline Packman, Parent in the Trenches. Creative people are willing to take risks. They may not be jumping out of airplanes, but creative people are willing to risk failure. In fact, most creative people would say that failure is a normal part of the creative process. Most people don’t usually enjoy failure. It’s frustrating and disappointing. In order to avoid this discomfort, many people will play it safe, but that’s not creative. In your quest to be more creative, how can you become better at failing? Practice. As a parent, it’s hard to watch your student struggle and make mistakes. Our instincts tell us to jump in and help, give students direction, stop them before they mess up. But students who run into problems will learn to solve those problems. And the kids who are rescued from failure all the time? They don’t learn to solve problems…because they never have any. Claudia Bear is a Da Vinci parent, with daughters attending Da Vinci Design and the Innovation Academy. She has a background in both science and the visual arts. In addition to practicing optometry, Claudia is a department manager with Kaiser Permanente, where she manages projects, develops leadership training for managers, and serves on the medical center’s Innovation Design Team. Hello Designers! Below is your Week 29 update. Come out and support the students and staff in their friendly soccer game on Thursday, March 27th at 4:30 in Del Aire Park! As a reminder, there are no classes on Friday 3/28 as we have a staff development day. 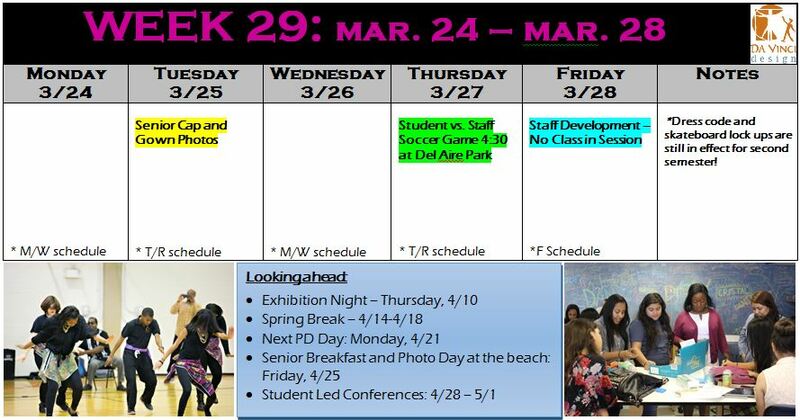 Seniors: Cap & Gown Photos will be taken on Tuesday, March 25th as listed on your senior activities sheet. You will take them during your Economics class period. Buy your Da Vinci Design Yearbook! Greetings, Designers! 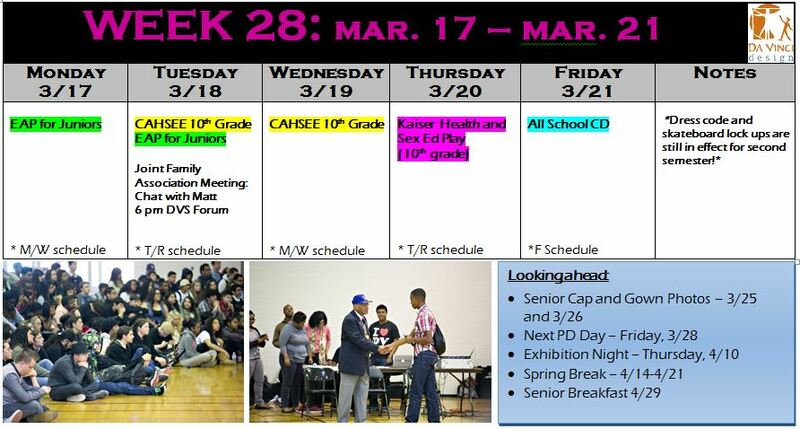 Week 28 brings testing for our Juniors (the EAP) and Sophomores (the CAHSEE). In addition, there is a joint, all DV schools Family Association Meeting at the Forum at Science on Tuesday 3/18 at 6 pm for the annual “Chat with Matt”, which highlights an address from our executive director. Globe Field Trip – Last Day to Apply is Monday! 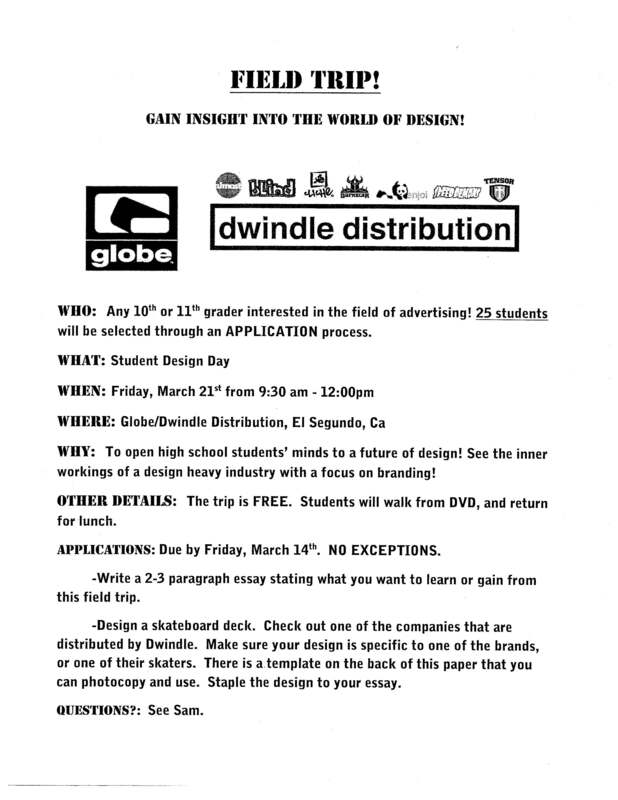 Click on the link below to print out the application. Next week, two standardized tests will take place on campus. On Monday, March 17th and Tuesday, March 18th, all DVD juniors will take the California State University Early Assessment Program Essay Exam in their English 11 class. The EAP is an opportunity for students to obtain information about their readiness for CSU college-level English and mathematics. If they do well on the exam, they will test out of CSU remedial courses. On Tuesday, March 18th and Wednesday, March 19th, all DVD sophomores and a few upperclassmen will take the California High School Exit Exam. The exam will test their English and math skills, and the students must pass both sections in order to graduate high school. If they do not pass this time around, there will be other opportunities. Please encourage your student to get plenty of sleep, eat healthfully and study the test-strategy notes their teachers have shared with them. While the ability to concentrate and work hard is an important creative skill, creative people also know that ideas don’t always appear on-demand. When the next step in a project isn’t obvious, it can be useful to take a break and put the work away for a period of time. Neuroscience studies have shown that your brain is always hard at work, even when you don’t realize it. If your student hits a roadblock while working on a project, try having him take a break for a while. When he comes back to the work later, he can look at it with “fresh eyes.” The answer to the problem will sometimes be obvious. Other times, the answer to a problem may suddenly appear in an “aha!” moment, as he does chores or walks to school. This creative strategy is often referred to as insightful problem solving. It’s most important for students to understand that they can’t rush insightful problem solving. Lots of students brag about “pulling an all-nighter,” but when a student tries to do everything at the last minute, he won’t be able to take advantage of insightful problem solving. Instead, starting an assignment early allows the student to take some breaks, which will maximize the creative process.